How was your 2014? We hope the good outnumbered the bad, but if not commend yourself for navigating your way through it. Our family had a combination of happy and sad. January 2014 was a very sad month at our house. We had to say good-bye to our beloved 17-year-old cat, Sir Sigmund Alexander of Clarks’ Crossing, MBC (Mouse and Bat Consultant). We went off to the vet with Siggy and his teddy bear both wrapped in his blankie. After an injection, Siggy slipped away peacefully in Glenn’s arms. We were a complete mess. The vet invited us to stay with Siggy as long as we wanted. He also showed us a back door where we could slip out with our red, puffy eyes. This year I got carried away with buying items in large quantities. Why buy just one when you can get a deal on 500? Beats me. On one occasion Five Roses flour was on sale online at Wal-Mart. I got the bright idea to order four 20 lb. bags which would be delivered to my door. It caused quite a stir when it arrived at the Post Office. They considered calling the police because there was white powder leaking from the box. Was it a terrorist attack? Was I trying to smuggle 80 pounds of cocaine with a street value of $8 million into Canada? (I have definitely watched too many episodes of “Border Patrol.”) Thankfully, the Post Office decided to deliver it to our door. No police involvement. Phew! Then another problem arose. What was I, who bakes about twice a year, going to do with 80 lbs. of flour? I found people to take it off my hands and got some baked treats in return. Want some baked goods, but don’t want to do it yourself? Try my trick although you probably do not need to buy 80 pounds of it. We spent a week in Cuba in January. The weather was wretched. Cold days, but we still spent time beside the pool, not in the pool, wrapped in our towels. The ocean was too rough and the undertow was too strong so we couldn’t even go in the water. The funniest part was watching the Cuban people react to the cold. Dining room staff wore layers and layers of clothing and were still shivering. Oh, well, it was still better than Bobcaygeon or West Head in January. Better luck this year. Greta Anne Clark was born on September 26th, one day before my birthday. A wonderful birthd ay gift! She weighed 7lbs. 11 oz. and was 20 1/4 inches long. 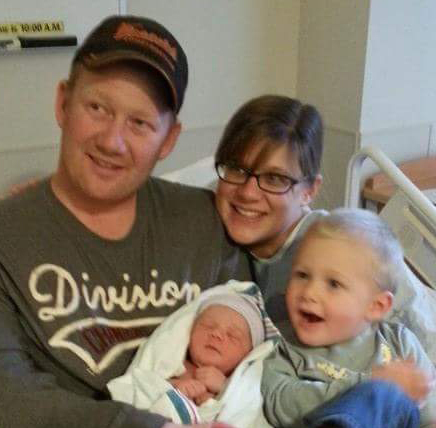 Grandchild number two and second great-grandchild for Glenn’s parents. Greta is a very contented little girl who loves to eat and sleep. I tell them to watch out if they have a second child. It could be a monster from under the sea. (This photo was taken at Greta’s first “Women’s Institute” meeting. I think they need to spice up their meetings.) And Isaac believes Greta is his sister. We love to spend time with Isaac who turned three on December 14th. He is so cute that it is impossible to say “no” to anything. 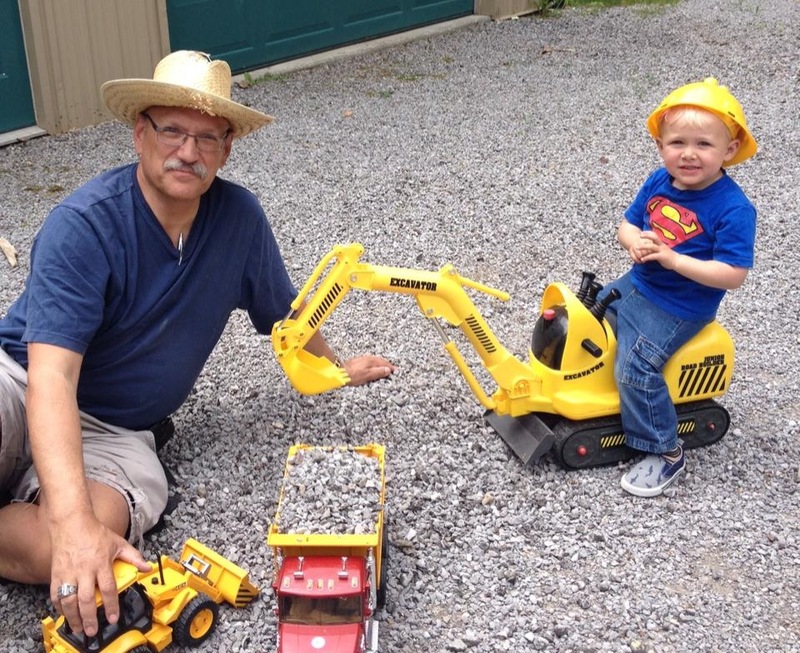 Grampy plays construction and wrestles and Nanny reads favourite books over and over. At the present time, “Going on a Bear Hunt” is our favourite. I hope Santa is listening. We love to hear the chatter of his little voice as he talks up a storm. If only everyone was as happy to see us as he does. Wheeeeeeeeeeeeeeeeeeee! Nanny! Grampy! And he thinks we’re cool. By the time you receive this, Allison and Ed will have welcomed their second child. Woohoot! It has been a very long nine months for Allison. Everybody has been asking Isaac if he would like to have a little brother or a little sister. For a long time, he insisted on having a big sister. I don’t think Allison would go for that. Isaac insists he has a baby in his belly and it is never coming out. We are eager to se e how he adapts to being a big brother. We hope he doesn’t respond like his Uncle Jeremy — he asked if we could put Allison out with the garbage. Tsk! Tsk! Tsk! It is impossible to believe that Isaac will be starting full day Junior Kindergarten this coming September. He is really excited to ride the school bus. Madeleine “Maddie” Laura Mae McGarvey was born on December 17, 2014 at 10:40 a.m. She weighed 7 pounds 9 ounces as was 19 inches long. We had a big surprise last October. Scott Davidson, owner of Hendren Funeral Homes, Lakefield and Norwood approached us about buying our Funeral Home. We couldn’t believe what we were hearing, and we certainly didn’t want to dismiss it. After months of dealing with lawyers and accountants to get every “jot and tittle” just right, the deal closed on June 25th, 2014 which marked the first anniversary of Glenn’s sister Evelyn’s death. We were happy to move out of the funeral home. We loved our ten years there and poured our whole beings into its success. Glenn was required to stay on until July 25th and by that time he was good and ready to leave. We left that same night for Nova Scotia. Retirement rocks! 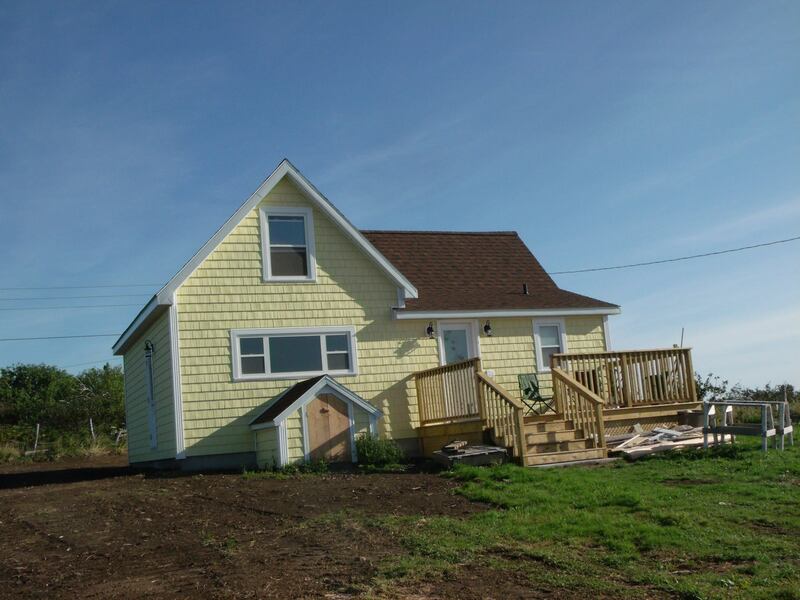 My cousin Andre Fiske and his crew totally renovated our family homestead in West Head. 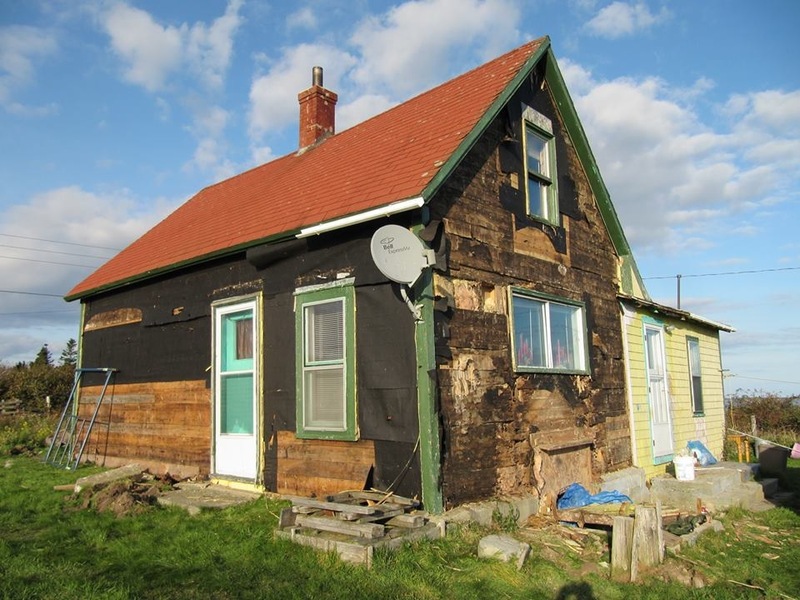 The house had rotted from leaky windows and years of neglect. As well, the northwest section had sunk several inches into the ground. Dad always said that there were 10,000 rocks under the house, but the house wasn’t sitting on any of them! It truly is a wonder that we didn’t fall through the floor. We have a brand new house. The staircase is the only original part. It’s all insulated, the floors are level, there’s a sink in the kitchen a nd not in the porch. The most thrilling part is, for the first time since 1972, the toilet flushes on the first try. Now we’ll run the well dry just flushing it for fun. Glenn did all the painting. He’s really good at it, so if you need a room painted, he works in exchange for coffee. All new wiring too, so you can plug in the toaster and the electric kettle at the same time. It should last for another 150 years. 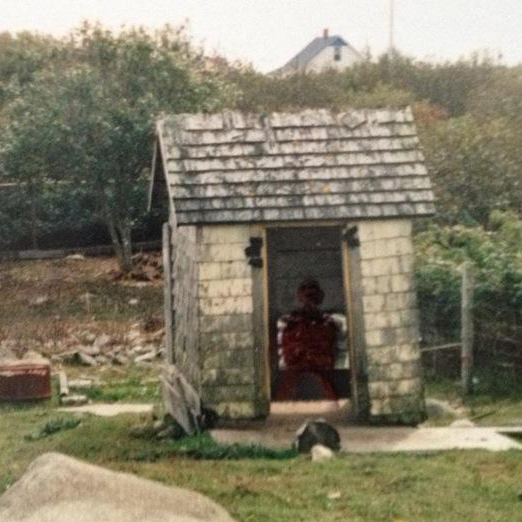 While we were there, our neighbour, Bruce Cotter, demolished a barn that American, George Frank, had built about forty years ago, thus restoring our view of the West Head Harbour. Thank you, Bruce! This time of year advertisers and charities strive to create the perfect Christmas commercial that will lure you into buying their product. I haven’t found my favourite one yet, but I did find some unusual old-fashioned newspaper ads. I love the cocaine for toothaches. For our countdown to Christmas this year, we are going to eat one box of sweet and juicy clementines each day. As I write this, it is December 10th and we are well on our way. I guess we won’t have to worry about scurvy this winter (or constipation). Well, that’s it for now. Glenn and I wish you and your family a wonderful Christmas and New Year. Always so many decisions to make. Did you resign your pastorate? We do our best to make the right decision with the information we have. How is your mom doing? Is she still doing alterations? We will be in West Head for the month of February. Hope to see you then. Happy New Year! Hi Melda!! Just saw this now sorry, I’m new to the whole blogging adventure. Yes i felt to resign my church last spring, and since then have been getting a lot of chances to preach in Pentecostal churches. Back to my roots. Hope all is well. Are you still home?? Glad you enjoyed it. Have a safe and happy New Year. Great to read about your homestead reno! Fond memories, Are you travelling here by car in Feb? Would love to see you! I am still in the same house you probably visited the winter of ’74 or 75! Lots od changes here as well. HAPPY NEW YEAR! God bless! We are driving from here to the Halifax Airport arriving the evening of Friday, January 16th. Then staying at a hotel where we will leave our van while we go to Cuba for 2 weeks. We land back in Halifax on January 31st. From there we are driving to Lockeport for the month of February. We will plan to visit on our way back to Ontario. That sounds great! We will be in touch for definite dates. My email is “florenceway@gmail.com.” Please contact me. Excited!